Emma Mattress Review - Should You Try The All Foam Emma Original? For this review, I’ll be digging into the signature all-foam mattress from UK bedding brand Emma. Featuring a combination of different foams (as well as some special Zoned Support channels), the bed has been designed to bring British dreamers an all-encompassing sleeping experience that’s as pressure-relieving as it is supportive. But just how well does the mattress pull this off? 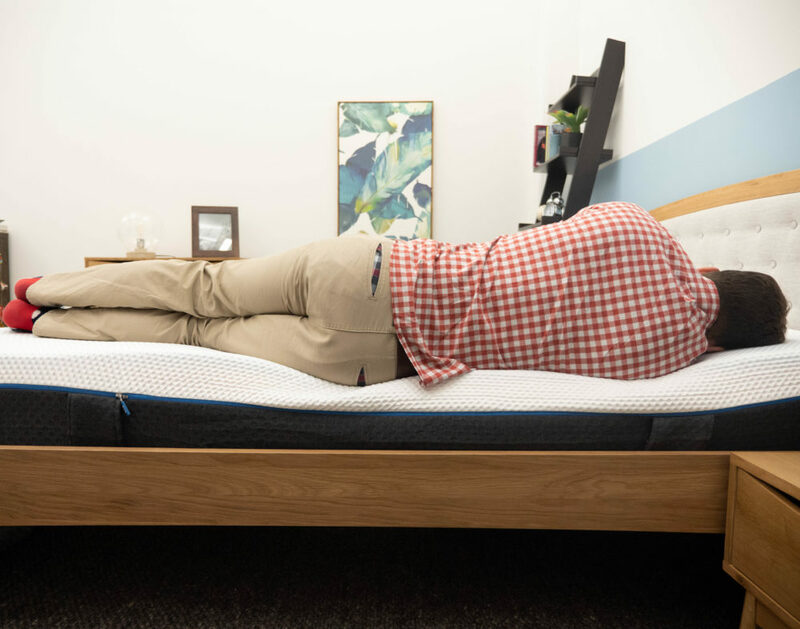 I won’t know until I put it through my series of tried-and-true tests, which should not only tell me how comfortable the bed is, but whether or not it could be the perfect mattress for you! 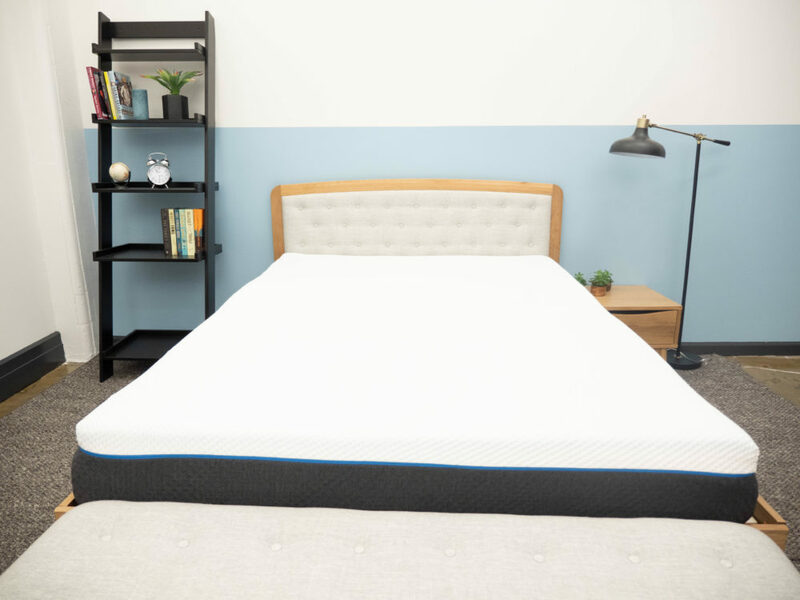 Also worth noting is that the Emma sells both this all-foam model as well as a hybrid mattress that features a pocketed coil system instead of the zoned foam. In this review, I’ll only be taking a look at the all-foam bed. Continue reading below for my full review of the Emma Original mattress. Don’t have time to read it all? Click here to skip to the bottom and check out my review summary. Emma: Use code BLACK30 to save 30% on your purchase of an Emma mattress until the 29th of November! The Emma mattress is built with three distinct layers of foam, stacking up to a 25cm profile. This combination of materials is intended to create a balanced feel, which should provide the sleeper with a healthy amount of both pressure relief and support. Aiding in this mission is a special system of Zoned Support channels, designed to bring targeted comfort to different parts of the body. I should also mention that Emma prides itself on conceiving, designing, and building all of its products in the UK, which means customers can rest easy knowing the company is dedicated to keeping things as local as possible. But enough chat! Let’s dive on into this bed. Cover – Made up of a removable, machine washable material, the Emma cover is elastic and snaps back into place easily. It’s also outfitted with what the brand describes as “special climate fibers,” which purportedly help to regulate humidity throughout the structure. Comfort Layer – The comfort layer is built with Emma’s Airgocell foam, a material that’s got a quick response to pressure and a gentle, medium firmness to it. Additionally, this layer features an open cell design, which works to dissipate heat and keep things cool throughout the night. Contour Layer – Directly below the Airgocell foam, you’ll find a thin layer of memory foam. Unlike the foam above, this material has a slow response to pressure, allowing the sleeper to sink into the bed for some satisfying comfort and cushiony relief. And while memory foam has a bit of a reputation for overheating at night, its position below the cooling Airgocell foam helps to mitigate this. Support Layer – Rounding out the construction is a thick section of high-density poly foam. The firm material brings some stability to the structure and works to support the softer sections above. You’ll also notice a series of channels that run throughout this layer, implemented to bring zoned support to sensitive areas along the body and to help with spine alignment. This is a pretty unique feature for an all-foam mattress like this, so is definitely something to take notice of. After taking a look at the construction of the Emma Original, let’s chat about the firmness and feel. I started off by applying light hand pressure to the mattress and the first thing I noticed was how bouncy it is. As I mentioned up top, the Airgocell foam has a quick response to pressure, which worked to lift me up and out of the structure. Pushing in further, I encountered the firm poly foam support layer. To be honest, I was kind of surprised by this firmness (which I’ll explore more below! ), but would say that you need to let this mattress decompress for a day or two before totally judging its feel as this firmness does decrease slightly over time. Since folks of varying shapes and sizes are going to feel firmness differently, I decided to enlist three other people to help me determine just how firm the Emma Original is. To do this, we each took a turn lying on the mattress, gave it a personal firmness rating, and then compiled these readings on the graph below. Thought feel is always going to be an individual thing, our responses should help to give you a sense of the firmness range you can expect from the bed. There was a bit of variance to our responses, but we landed on an average rating of 6.5, which syncs up perfectly with the industry standard for medium firmness. I personally gave the bed a 7 as I found its combination of bouncy Airgocell foam and high-density poly foam made for a firm structure that kept me squarely positioned on top of the mattress. While you’ll likely experience some pressure relief from the middle layer of memory foam, you won’t get the deep contouring you’d get from other all-foam mattresses on the market. That being said, I’d recommend this feel for combo sleepers who need to move around and change positions throughout the night. Another important component of feel is pressure, or more specifically where pressure points are likely to form while lying on top of it. 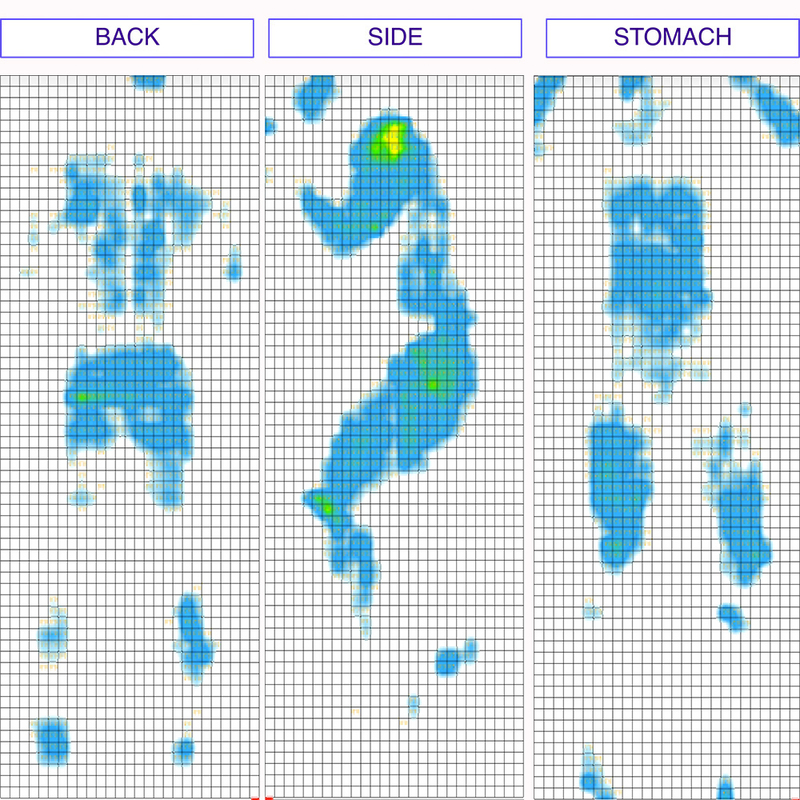 To help you visualize where these tension spots might crop up on the Emma, I placed a pressure map on top of the mattress and lied on my back, side, and stomach. You can see the results on the image below where pressure is represented from blue (low pressure) to red (high pressure). Back – Lying on my back, my weight was pretty evenly distributed across the surface of the mattress. I sank into the bed a little bit, but nothing so extreme as to make me feel as though I was sleeping “in” the bed as opposed to “on top” of it. Overall, I felt well supported in this position and found it easy to move around and change positions. 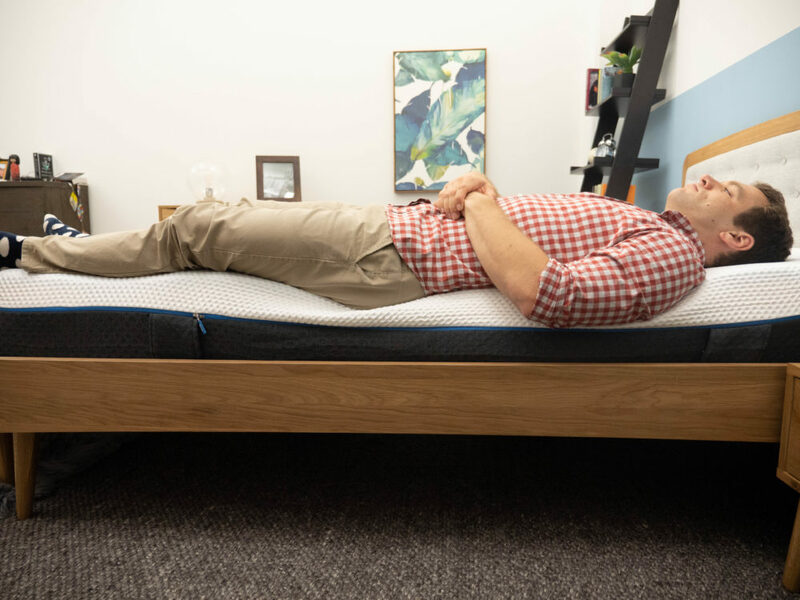 Side – When a strict side sleeper lies on a firm mattress such as this one (at about a 7/10), they’ll usually notice tension at the shoulders and hips as these sensitive spots push into the mattress. While this can cause discomfort and stiffness, this is somewhat alleviated here by the Zoned Support channels running through the support layer. They allow the sleeper to sink more into the dense material than they normally would, helping to keep the spine in an even alignment. Stomach – Keeping the spine aligned is also important for stomach sleepers, who need to ensure that their shoulders and hips don’t sink out of line with one another during the night. Rolling onto my stomach, I felt a lot of comfort as the bouncy Airgocell foam helped to position me on top of the bed. Now that we’ve gone over some of the finer points of the Emma Original, I thought it might be useful to compare it to a few other beds I’ve reviewed. While mattresses will always feature characteristics that make them distinct, it can be helpful to contextualize these specs against those of other beds on the market. When checking out the Emma, my mind inevitably swung to Eve, another UK-based mattress company that’s been making big waves in the online bedding sphere. Below, I’ll breakdown some of the most prominent similarities between the two British brands. 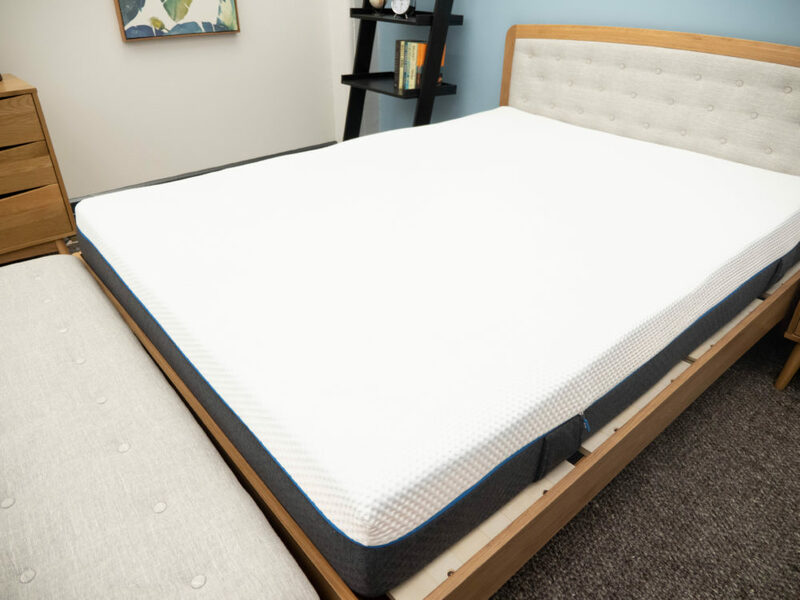 Balanced Foam Feel – Both beds are outfitted with a three-foam construction that features responsive foam, memory foam, and a high-density poly foam support layer. This combination of materials creates a balanced feel that’s pressure-relieving and supportive. 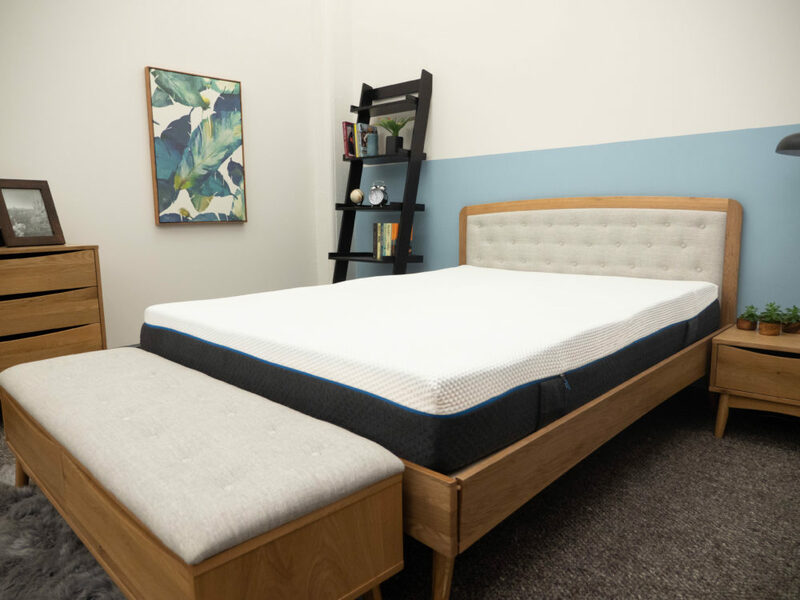 Firm – While these two mattresses are built solely with foam, they’re still pretty firm, with both landing an average firmness rating of around 6.5/10. Another bed that came to mind while lying on the Emma Original was the Casper UK, which also employs an all-foam construction as well as Zoned Support for added comfort. Again, I’ll call out these mattresses most similar features. Breathability – Both the Emma and the Casper UK are designed with breathability in mind, whether through open-cell foam (Emma) or convoluted channels through the support layer (Casper). Zoned Support – These two mattresses also feature something fairly unique for all-foam mattresses: Zoned Support! 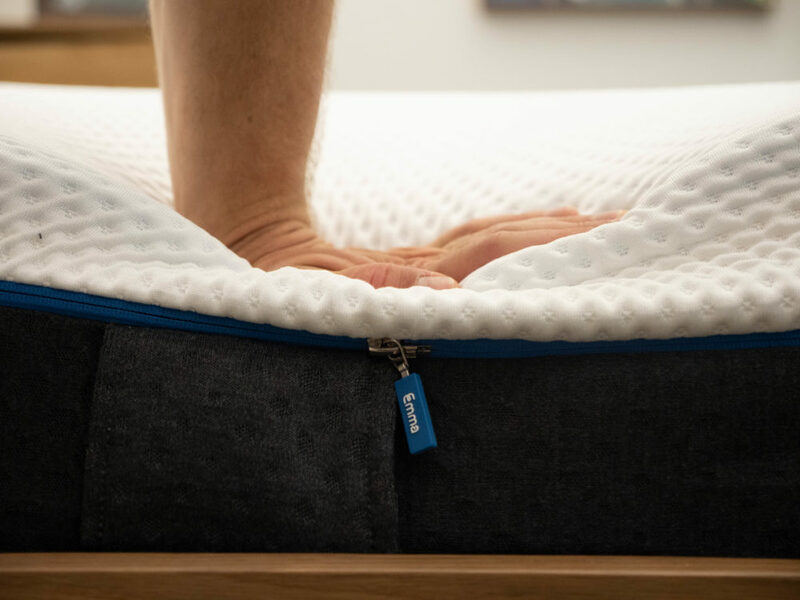 Found in the foundation layers of each of these mattresses, the grooved channels work to bring targeted relief to the shoulders, hips, and lower back. Up next, let’s take a look at motion transfer, or the amount of disturbance you’re likely to feel from one side of the mattress to the other. While this test will be important for all sleepers, it’ll be especially pertinent for those of you planning to share your bed with a partner as it’ll clue you into how bothered you’ll be by their movements in the middle of the night. To illustrate this motion transfer, I dropped a 5 kg steel ball from heights of 4 inches, 8 inches and 12 inches and measured the disturbance it caused: the bigger the lines, the bigger the disturbance. FYI: Each drop is meant to symbolize a different movement you’re likely to experience in bed, from tossing and turning (10cm) to getting out of bed (20cm) all the way to full on jumping (30cm). 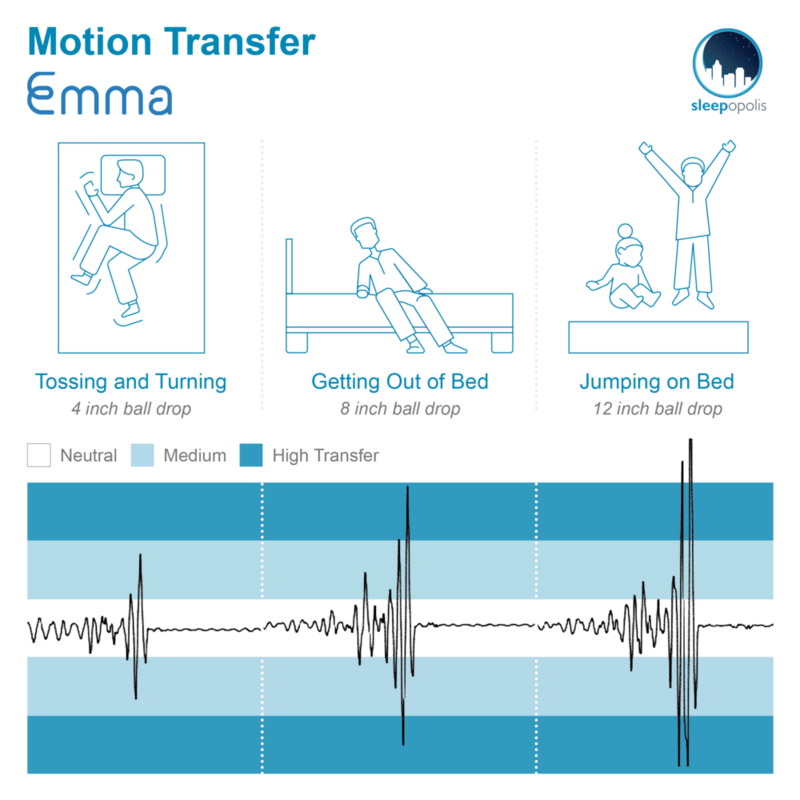 These are pretty average motion transfer results, which tells me that you’re likely to feel your partner’s tossing and turning in the night. This isn’t that surprising when you consider how bouncy the mattress is, but is something for light sleepers to take note of. When buying a new bed, most people want to know whether they’ll feel like they’re sinking “into” the mattress or lying “on top” of it. 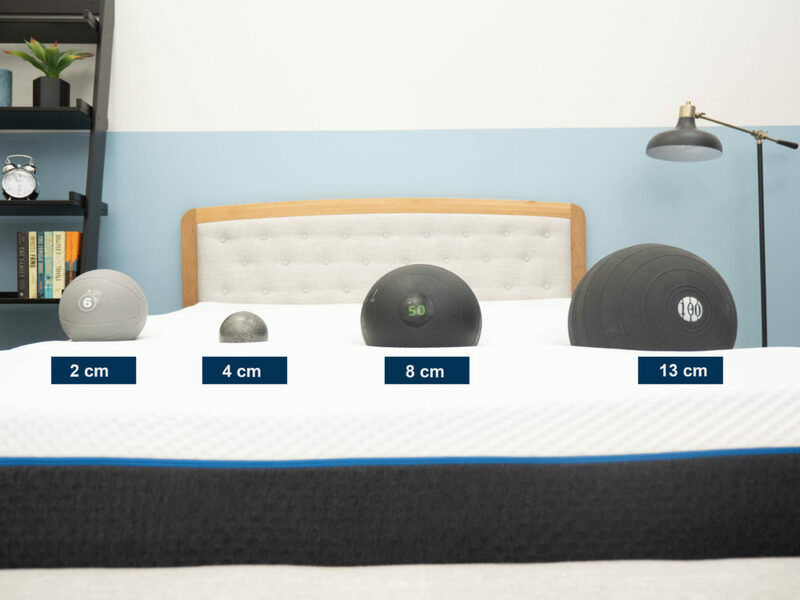 To visualize this sinkage, I placed four balls of varying sizes and densities (a 3 kg medicine ball, a 5 kg steel ball, a 23 kg medicine ball, and a 45 kg medicine ball) on the mattress and measured how much they compressed the surface. Using differently weighted balls to simulate body parts and check how far into the the Emma these balls sink. 3 kg medicine ball: 2 centimeters of sinkage. 5 kg steel ball: 4 centimeters of sinkage. 23 kg medicine ball: 8 centimeters of sinkage. 45 kg medicine ball: 13 centimeters of sinkage. This really isn’t very much sinkage at all, thanks to the combination of buoyant Airgocell foam and high-density poly foam in the base. What this tells me is that you’re likely to feel more on top of the mattress as opposed to in it, which could be a great feature for stomach sleepers and those who change positions throughout the night. If you’re convinced the Emma Original is the right mattress for you, the size and pricing information for the mattress are below. Please note that these prices reflect standard pricing, but coupons are often available. IS THE EMMA MATTRESS RIGHT FOR YOU? Given the bouncy yet pressure-relieving nature of the Emma, I’d say it could make a great fit for combo sleepers who need to move around and change positions in the night. Another great feature of the bed is its series of Zoned Support channels, which help bring targeted relief to the shoulders, hips, and spine. The bed is also super breathable, working to regulate temperatures and keep things cool throughout the night. If you’re looking for a more plush vibe, you may not be totally satisfied by the Emma, which features a lot of firm support. Couples may also be disappointed in the bed, which didn’t do very well on my motion transfer test. For more information on the Emma Original, visit its website here! The Emma is a medium firm mattress built from layers of foam and coils. The combination of these materials creates a “best of both worlds” type feel, offering faster response times, good body contour, good pressure relief, nice bounce and cooling, and a solid level of support. For the sleeper who enjoys a more responsive mattress while still receiving a good level of contour, the Emma is certainly a mattress that should be considered.